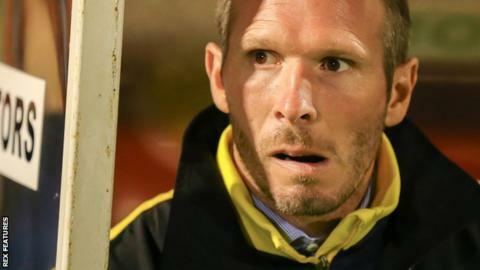 Oxford United manager Michael Appleton says basing his squad in the North West between away games has helped bonding. The Us decided to train at Preston and Bolton between trips to York and Accrington rather than returning to Oxford between the fixtures. "We felt it was the right preparation instead of spending two long trips on the coach," he told BBC Radio Oxford. Sixth-placed Oxford will look to climb back into the top three of League Two with a win at fourth-placed Accrington. Appleton also revealed he took the squad out to watch Wigan and Huddersfield in the Super League play-offs on Thursday between training sessions. "They went to see real men playing sport for a change," he said. "I'm a bit biased as that was my second sport when I was a teenager. "The boys also took advantage of some time out shopping together, but I'm not sure it was worth it after some of the outfits I saw them in last night." Appleton said midfielder Kemar Roofe is fit and available for selection despite still recovering from a shoulder injury sustained last month. "It's an injury that needs to be managed between games, but he's got various exercises he does and is getting stronger and stronger," he added. "He's very relaxed with it during games and isn't struggling."